Free from clogging and leakage resulting from polymerization(coagulum)of Latex liquid. 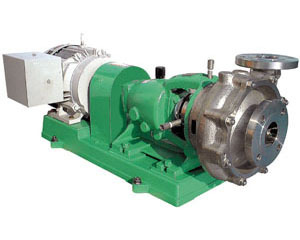 Compared with conventional pumps, BLS does not required frequent overhauling with lower maintenance cost. BLS has a lowpolymerization rate of latex liquid which is one-thirtieth of conventional pumps. It helps maintenance of the original latex quality. BLS can also be used for clog-free transfer of more chemically unstable 750mPa·s∼1000mPa·s, and 1400mPa·s natural latex liquids. Viscous liquid and Adhesive liquid. 1. Specially designed seal construction for latex. a. Knife-edge mechanical seal + Gland packing construction backup. b. Knife-edge mechanical seal + Multi-spring type mechanical seal construction backup. 2. In addition, other Mechanical seal (single or double) and Gland packing may be installed on request.